I've been focusing on cupcakes for the past 3 years in my jewelry, but didn't really have cupcakes around me. So in 2009 I started acquiring whimsical cupcake items because...well, they just make me smile! First up is the sugar shaker I got online from The Weed Patch Store where you can find other fun cupcake goodies as well. It was only $4.99. T.J. Maxx had the red cupcake with the heart on top, and the blue one with the peppermint candy handle was discovered at Kohl's in the housewares department on clearance for only 8 bucks. They are all containers with lids and I just love them. I have one other container and a cupcake plate that I just found at Ross yesterday, but have no photos yet. It's funny how Valentine's Day is the time most stores have cupcake items. I wonder who thought of mixing the two? 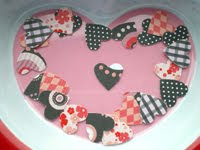 I love to mix them as you can see in some of my jewelry where the cupcakes have little hearts on them. There is just something sweetly special about combining the two. And it makes me smile. Isn't that what life should be about? You betcha! 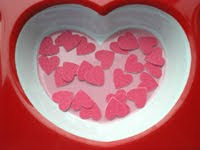 Don't my handpunched heart stickers look sweet in my new plastic cupcake & heart tray from Safeway? It was such a nice surprise to come across this week and the perfect item to give my sticker photos some zing! These are listed in my MomsArt shop on Etsy. Okay, my last food story. I've got to back to jewelry this week and finish my Valentine goodies! probably detest the stuff, but when it is the perfect blend of creamy milk, brown sugar and bananas, I feel very comforted considering the cold weather. Used to have it when I was a kid and needed a "fix" so I bought my first box in probably 20 years. Sure was yummy! It will give me stamina when I take my walk later. 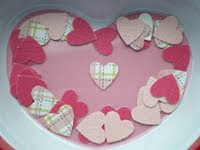 Okay, my goal is that on my next post I will have Valentine jewelry for you before the end of the week. I just received this fantastic furnace glass called Good 'n Plenty, in colors just like the candy after which it was named. Is there any color combination better than pink, black & white? It just puts me in a Parisian mood every time....never been there but I can just feel it, ya know? I'm a little later getting started than I'd planned, but am excited to add these to a few pieces I'm designing for Valentine's Day. Ohhh, yummy! These are the beads I sent to my Bead Soup Party partner, Leslie. She likes to work with copper so I was hoping she would find this mix a good one. She emailed me to say she got them and loved them...once she picked her jaw up off the floor in awe of their beauty. Whew, wasn't sure if they'd be right but they worked out fine. The larger beads (lampwork) are by Payton Jett. The small yellow discs are citrine & the dark rounds apple jasper. I really dig the Bali sterling clasp in the dragonfly motif. The only 2 pieces we are required to use for this particular party are the large focal bead and the clasp, so we'll see what Leslie pumps out with this bead batch. Mine are on the way to me in California from her nearly all the way across the country from Pennsylvania. I'll show you what I got as soon as they get here and will then post photos of my ideas & progress all the way up to the finished product to be revealed in February! This jewelry was created by my Bead Soup Party partner, Leslie, from Bei Mondi. Just imagine what goodies she'll be sending to spark a fresh design from me! This is really going to be fun...read more details HERE. 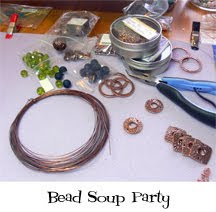 Click on the photo above to see what a Bead Soup Party is and why I want to be part of it! Just before Christmas, I bought a new wallet. A full size wallet where I don't have to fold my dollar bills...ahhhh, nice. Problem: it was just a little too big for my current purple purse that I love and for which always get compliments. The purple purse only had one large compartment and a couple of little pockets...and it just wasn't working anymore so I was on the prowl for a new one. I thought, leather would be nice for a change, but all my past bags have looked like leather and I was still fine with that. Now, I am always looking for a deal and clipping coupons, so off I went....to Target, since I had to go there for other goodies...found mostly hobo bags which I didn't want....Penney's...just didn't have a style that I liked....off I went to TJ Maxx, Ross and Sears....hmmmm, no luck at my usual haunts. I figured, well, it's time to step this up and hit Macy's, knowing full well I was going to have to spend more there. As soon as I entered the store at the accessories department, I thought, Man, was I ever in the right place! Beautiful bags, pretty styles and lots of them. Problem: my little tests just weren't working, and the purses HAVE to pass the tests or they just aren't worth a darn to me. First test: does the shoulder strap actually STAY on my shoulder? Next, does it have more than one compartment? Does it have little pockets for lip products and a cell phone? Does my danged new wallet fit? Is it NOT black or brown? And baby oh baby, is it ON SALE?????? I hit every darned sale section I could find and nothing hit all these points. I got SO close with a fabulous turquoise bag, but the double straps just got in the way. Then, finally, there it was...a table that had, not 40% off like most of the others, not 25% off but 65% off! It was a huge, square table. I started on one side lifting, moving, digging; moved to the second side...nothing, the third side, and finally the fourth...and THERE it was. This yellow bag with a great shape and just enough embellishments. Yellow? Hmm... I own nothing yellow. I'm a pink, purple, blue wardrobe gal. But this yellow is a butterscotch tone, not bright, and it just looked right. 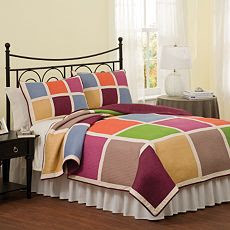 And the interior is a circus of color stripes...what a bonus! My sis gasped when I told her later that it was some brand called Tignanello....I'd never heard of it, but she had and knew they were pricey (at least in our book). She also mentioned she has found more items on that sale table than in any of the other sale sections. Testing, testing....shoulder strap stays on? Check. Multiple compartments and little pockets? Check. Check, check, check....buy! Down from $169, I got this baby for $59 AND I had forgotten to take my 15% off coupon from home, but I didn't care! It's all leather and worth every penny and I love it. And isn't that what it's all about? It's in the bag, baby, in the bag. and they'll be shipped to you free of charge, woohoo!